We're excited about entering into our 30th year of service to the Central Florida hockey community. We are moving forward with a new club identity and training and development philosophy committed to delivering the most comprehensive and positive player growth opportunities. Welcome to the all-new Central Florida Hockey Club! Coaching Staff – A tremendous staff of NON-PARENT HEAD COACHES for all of our teams both at the AA and A levels. Our head coaches have played and coached at the junior, collegiate, and/or the professional levels allowing them to share their knowledge and experiences with our players. 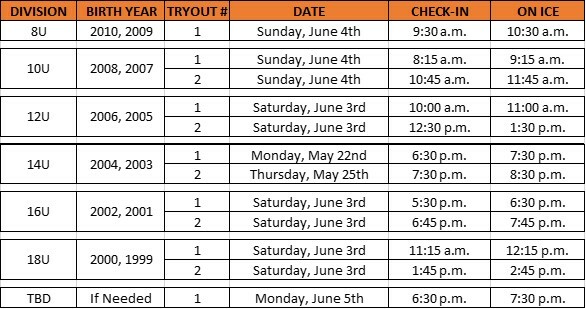 All players are strongly encouraged to attend all age-appropriate tryouts if applicable. Selected players will be contacted by the coach and offered a commitment letter to guarantee a roster spot. Selected players will have 48 hours to sign protecting your status and early bird pricing (tba). OYHA reserves the right to move on to the next player should the player forego signing when offered.